Just wondering about whether an electric fan was standard fitment (I would guess the one I have isn't) and whether it's really needed and/or the best way to wire it in if I keep it? 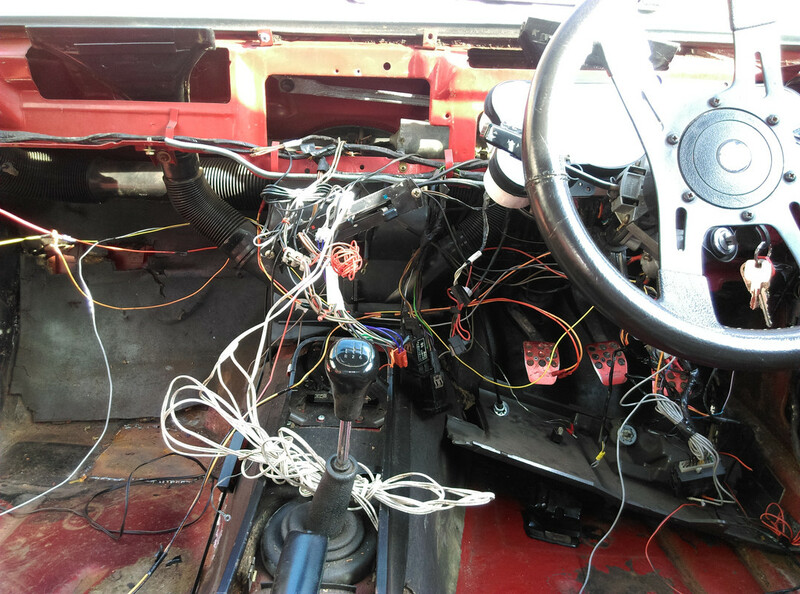 I spent most of Saturday pulling out a mess of wires behind the dash! Aftermarket alarm wired into the indicator loom, as well as the aftermarket air horn also aftermarket radio which has a run off the ignition into an old electrician's joining box thingy which then also has another wire running out to go off to the electric fan - nightmare! Is that Spaghetti Carbonara or Spaghetti hoops in there? My Laser was bad with two aftermarket alarms DIY wired in there but that takes it to a new level! Seriously Danny I would, with the help of wiring diagrams, remove the lot and start again. Most of the Ford wiring is wrapped in loom tape except obviously where it comes out to connect to anything and you may well have to undo some of this tape to find out where people have wired in this crap. I'm no electrician to put it mildly but just working carefully away at it I got rid of the crap and could then start again with what i wanted. Don't worry about speaker wires, air horns or electric fans, the 3.0S would have had none of these when it was new and you can properly wire these things in, using relays, at a later date if you want them. The radio feed wire for ignition live is a yellow wire which comes out of the ignition switch, the earth was a braided wire going to the bulkhead and the original speaker was in the dashboard. People often take a permanent live off the feed for the clock or the cigarette lighter. Paul G wrote: Is that Spaghetti Carbonara or Spaghetti hoops in there? My Laser was bad with two aftermarket alarms DIY wired in there but that takes it to a new level! I managed to get the alarm off and most of the radio out - what had largely happened is someone found the nearest live wire in vaguely the right area of where they were fitting something (also some flashing LED strobe lights!) and just cut into the loom and tacked it on - clever idea when you're being super lazy but a ball ache when I've got to fix it I have now managed to largely get it all off and out now, but whoever wired the radio in decided it would be a good idea to take the original live feed from the ignition, cut in a new wire, run that to the radio, and at the same time botch clip another wire to it and run that to the fan on/off switch on the dash and then onto the fan at the front - what a pain in my balls!! Main thing I need to do is start taking the engine out to start the front end repairs but will be a big job and seems so daunting! Very disappointed to read you are removing the wiring to the LED strobe lights, or did I misunderstand? Noel wrote: Very disappointed to read you are removing the wiring to the LED strobe lights, or did I misunderstand? they have come out for now - to be honest only a few of the lights on the strip actually worked!